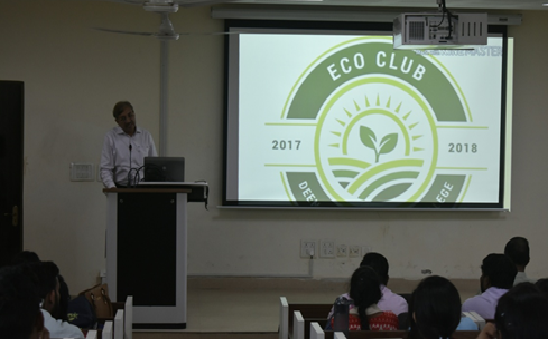 September 18, 2017: Eco-club's 2017 session marked it's beginning with Film Screening on "Conservation of Natural Resources" followed by Poster Making competition, on the same theme. October 2-5, 2017: The students participated in ‘Global Wildlife Program Conference’ on the theme “People’s Participation in Wildlife Conservation” organized by the Ministry of Environment Forest and Climate Change in association with the World Bank and UNDP at New Delhi. Representatives of 18 countries from Africa and Asia participated in the conference that served as a platform for great learning opportunity to youths in enhancing their awareness and contribution towards conservation of the pristine wildlife. October 16, 2017: The members of Eco Club and NSS jointly organized ‘Green Diwali’ drive in college and neighbouring areas aimed at fostering environmental consciousness among the people. 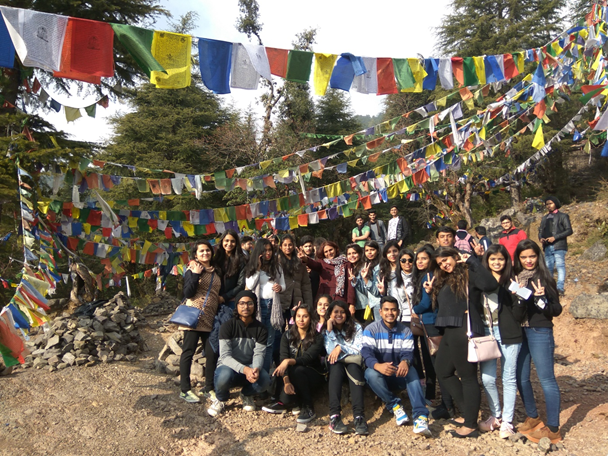 This year’s Eco Club trip to Naddi, Dharamshala witnessed great adventure. November 2-5, 2017: Eco Club was invited to be a part of "9th CMS Vatavaran", Asia’s largest International Film Festival and Forum on Environment and Wildlife, held in the vicinity of Gandhi Smriti, opposite Rajghat, New Delhi. The festival witnessed mass participation from various schools and colleges where students got a platform to present their artistic and creative side. Our team participated in the event of Venue decoration on the theme ‘Conservation of Water’. The purpose of the festival was to create awareness among the youth about the pressing environmental issues. The events under Eco-Club were initiated on September 16, 2016 with the observance of International Day for the Preservation of the Ozone Layer. An audio-visual presentation on the current scenario and future prospects of Ozone layer conservation was organized in which students across the courses participated. Various events and competitions were held like poster making, waste-o-mania, debate on ―environmental issues in Delhi-NCR: Causes and solution‖, environmental quiz and environmental photography in which students from different courses participated actively. An awareness campaign to promote Green and pollution free Diwali was organised on October 26, 2016 in college premises and nearby localities. 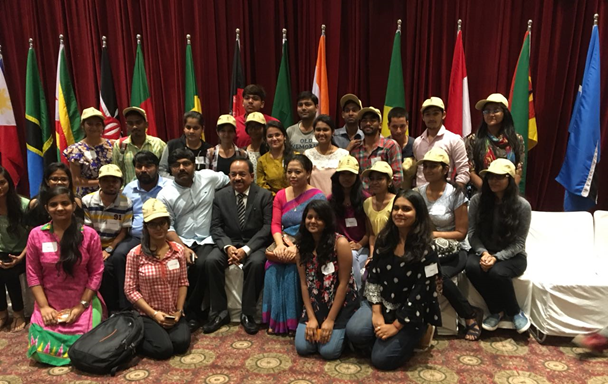 About 200 students and faculty members participated in the same. An excursion of 40 students from various courses was taken to Naldeshwar (Alwar, Rajasthan), Sariska National Park and Tiger Reserve (Alwar, Rajathan) and Keoladev Ghana National Park (earstwhile Bharatpur Bird Sanctuary, Rajasthan) from February 24 to February 26, 2017. Naldeshwar is a natural shrine and trekking site at high altitude where students got the chance to be familiar with the nature and its intricacies. At Sariska National Park, students got the opportunity to see a plethora of flora and fauna of dry tropical ecosystems. Surprisingly, in Keoladev Ghana National Park they encountered a large number of migratory birds and local bird species apart from other wildlife. The excursion was culminated with a surprise visit to Bhangarh Fort (Alwar, Rajasthan) which is claimed to be one of the most haunted places in Asia. The inaugural lecture was delivered by the noted wildlife biologist Dr. Faiyaz Ahmad Khudsar on “The Challenges to Biodiversity” with special reference to the environmental laws pertaining to conservation of Asiatic lion in Indiain September, 2015. To commemorate the World Sparrow Day, a group of 120 students visited and observed different species of birds at Sultanpur National Park (Erstwhile Bird Sanctuary) on March 19, 2016. They got an opportunity to see different migratory birds and their exposure to various threats while visiting the National Park. A cleanliness and environmental awareness drive was also organized in nearby areas of the college campus on February3, 2016.